HomePalmistryPalmistry FAQs – Which Hand Do I Read? Does My Life Line Predict My Lifespan? Did you know that – The lines on your palm change over time? Your Life Line doesn’t predict your longevity? You can learn the basics of palmistry in a matter of days or weeks, with the right education and hands-on practice?In my home country of Hong Kong, palmistry is very popular, however in Australia many people have never had their hands read. Here is a brief introduction to palmistry, and what it can reveal about you. This article is based on my approach to hand reading, which blends traditional and modern teachings. My palmistry readings have been featured on Brisbane’s top morning show, 97.3FM with Robin, Terry & Bob, where I am the resident psychic. I’ve also taught dozens of palmistry workshops and courses in Brisbane – read more on my classes. So, what is palmistry? It’s the art of reading hands, including the skin, palms, fingers, fingerprints and nails. The idea is that your hands record your recurring thoughts and feelings and therefore show your spiritual, material and emotional progress to date. Johnny Fincham (a UK palmist) calls the palm ‘the visual brain’. Learning palmistry is like picking up a language. Once you master the basics, it’s about building knowledge through trial and error. Which hand do I read in palmistry? 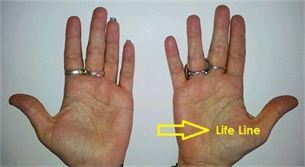 I read both hands (Active and Passive), however if the person is over 20 years old I spend more time on the Active hand. The active hand is the hand you use to write or to throw and catch a ball. It represents your conscious mind and the life you have created for yourself. The passive hand shows your subconscious, childhood, inheritance and past lives. If your hands are similar, you have achieved your potential in life. If your Active hand is stronger (e.g. darker lines or less breaks), I’d consider you an optimist who has pushed beyond their comfort zone. If your Passive hand is stronger, you may be a late bloomer. Skin Texture – How sensitive are you? Hand Size – How practical are you? Palm Colour – How calm are you? Palm Shape – What are your goals in life? Finger Length – Can you deal with details? Knuckles – How impulsive are you? Nail Length – How defensive are you? What environments will bring you success? Thumbs – How controlling are you? Are you a leader? Fingers – Are you an introvert or extrovert? What kind of childhood did you have? Are you a risktaker? Are you more masculine or feminine in your approach to life? Venus Mount – How much energy do you have? Luna Mount – Are you emotional? How creative are you? The Life Line – How brave are you? What ages will major ups and downs occur? Will you travel? What’s your health like? Please note – the Life Line does NOT predict what age you will pass away, but it can give clues as to your health and life quality. It also shows me whether you keep energy in reserve or tend to burn the candle at both ends. The Head Line – Are you a problem solver? How do you deal with stress? What’s your ideal career? When are you likely to switch careers? Do you sleep well? What’s your memory like? The Heart Line – How romantic and caring are you? How easily do you move on after a breakup? Do you look for commitment? The Fate Line – Are you responsible? Do you know your purpose? Will you attract wealth? What’s your relationship with Spirit like? The Sun (Apollo) Line – Do you have inner peace? Can you find bliss in the simple things? Is your mind open or closed? Can you relax on your own? The Mercury Line and Allergy Line – How psychic are you? What’s your digestion like? I also check your fingerprints (read more on fingerprints) and skin markings, including the Loop of Humour, Loop of Serious Intent and the Girdle of Venus (a sign of sensitivity, intense creativity and childhood challenges – read more). My first love will always be palmistry, because it’s so good for your self-confidence and trust. I believe that, the more people in tune with their bodies, the better. Listening to our inner wisdom is the path to enlightenment. As you change your thoughts and actions, you also change your hands and destiny. You’re also invited to join my facebook page The Numbers Queen. You’re welcome to post on the timeline. You can also subscribe to my e-news for articles (see homepage). Or write to me below, or via email. Comments will be published once they have been approved. For greater clarity, why not book a reading with me to discover your life purpose?